Time passes and human civilizations leave their marks. The remnants of different human civilizations present in todays’ world are called as Archaeological sites and preserved as heritage. A visit to any such site takes the person in an imaginary visit in Past. 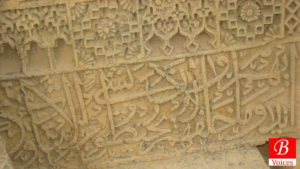 Same thing happened to the author when he visited the Chaukhandi tombs in Dureji and Bhawani areas of District Lasbela. I felt like I am present in period where Alexander the Great is leading his army or Muhammad bin Qasim is entering sub-continent. 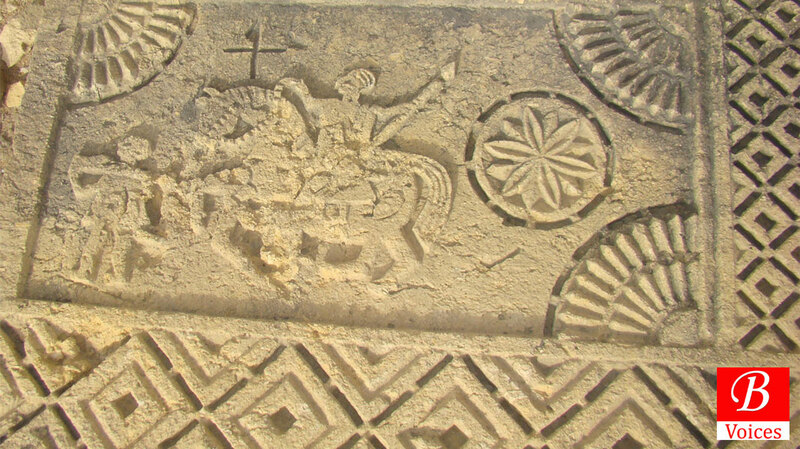 Obviously these imaginations are based on the myths related to these tombs. Chaukhandi Tombs or generally known as Rumi graves are a significant archaeological site of Balochistan which is also endangered. 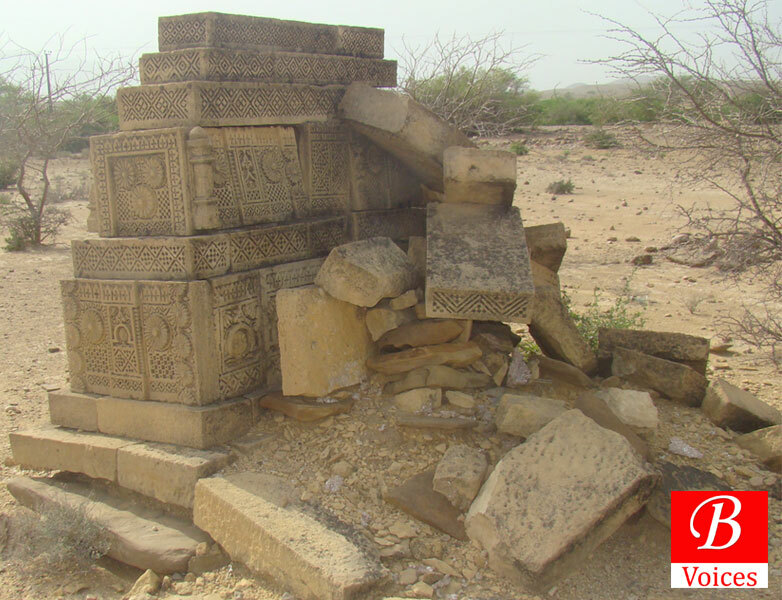 Situated at a distance of 50 KM in west of Karachi, the tombs are spread from Sarai Graveyard at Hub till Kund Malir on costal highway, in district Las Bela. 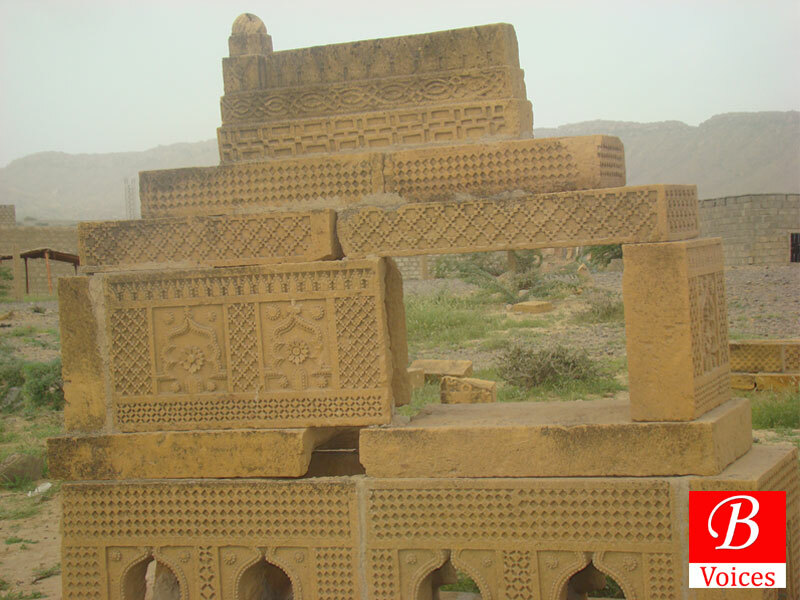 Original Chaukhandi Tombs are situated in Sindh and the tombs in Balochistan are extension of those. Since, there has not been any research on the tombs in Balochistan that’s why these are also called Chaukhandi Tombs. A couple of months back it was reported on local media that heavy machinery work was started by a private cement factory close to Chaukhandi Tombs at Sarai Graveyard at Bhawani. This is one of the threats which is endangering the very own existence of these tombs. As per existing archaeological laws in Pakistan, digging or construction work close to an archaeological site is repugnant to the laws. This puts question marks on the safety of these sites and why government is not doing anything to control the issue. 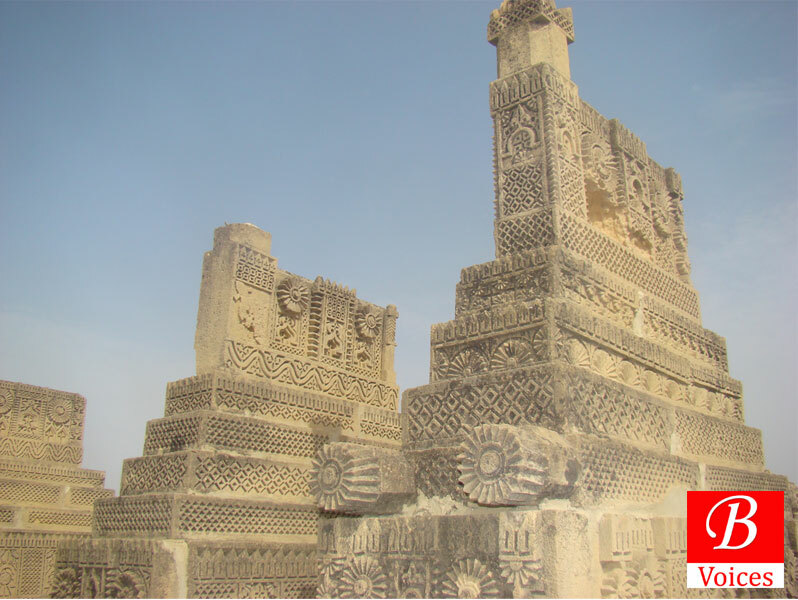 The first archaeological surveyor, Major M. A. Tighe, the then political agent of Southern Balochistan mentioned the Chaukhandi tombs in 1901. Later on, Dr. J. Ph. Vogel and others including Hennery Cousins gave detailed accounts of their work on these tombs. 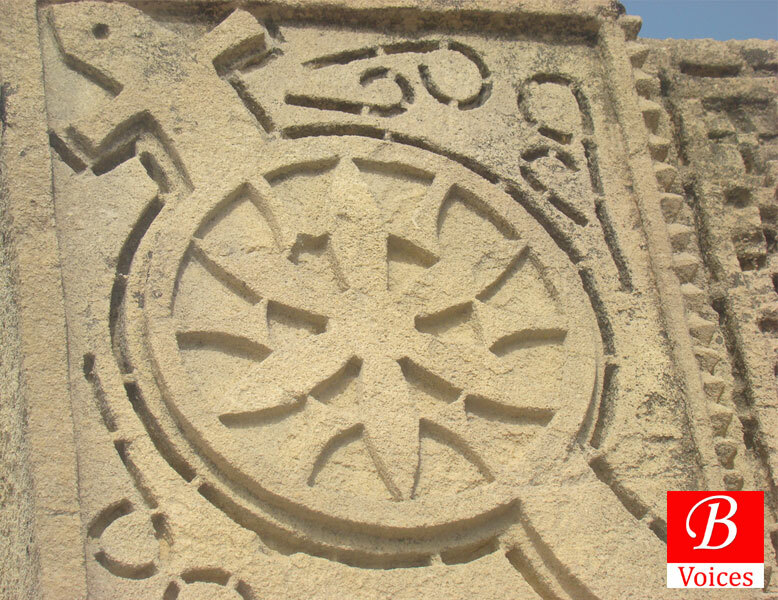 Like the intricate history encompassing the Tombs, the name ‘Chaukhandi’ has also drawn many archaeologists to have a detailed work on it. 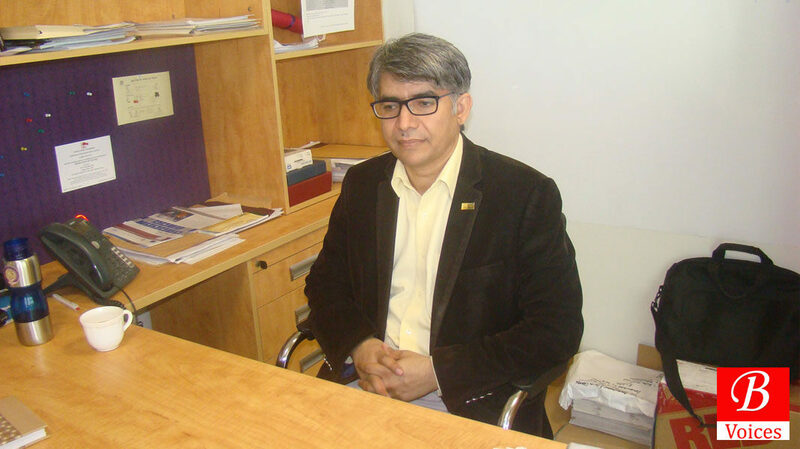 Dr. KaleemUllah Lashari is the first post-colonial researcher to weed out the myths linked with the name: Chaukhandi. In fact, after delving into the research work of Dr. Lashari, it is safe to define the word Chaukhandi as ‘a canopy bolstered by four pillars’. 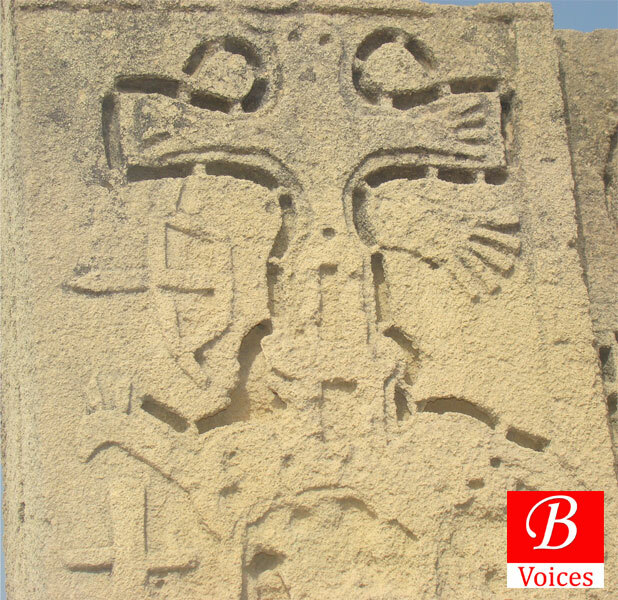 “As the ruins depict that how impressive the building was, these historical tombs also reflect that the dead were from ruling classes and had a rare funerary culture,” explains Dr. Hafeez Jamali, a social anthropologist who teaches at Habib University Karachi, while talking to Balochistan Voices. 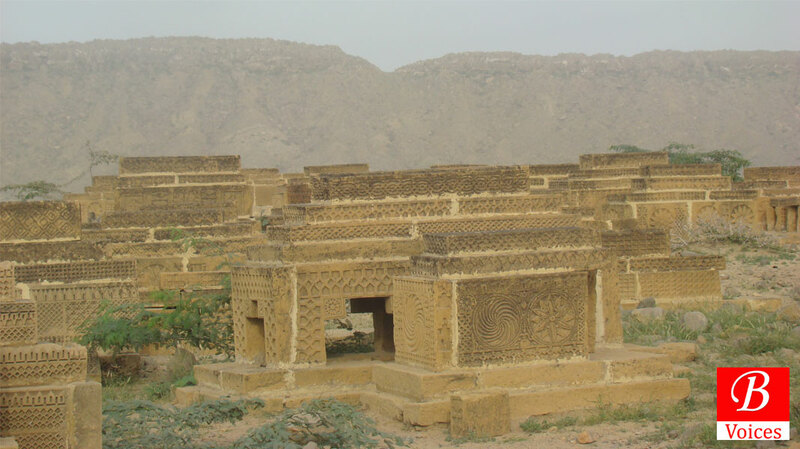 Dr. Jamali is of the view that the area stretching from Thatta to Lasbela remained a district (Kohistan at the time) under Dehli Sultanate and these pre-colonial graves are of the elite ruling classes those were reckoned among the powerful Baloch tribes in the district. Archaeological sites, such as the Chaukhandi tombs, derive their significance from the myths and legends attached to them. The myths and legends make them an integral part of the folk culture of the areas where the sites are situated. There are many mythical stories linked to Chaukhandi Tombs regarding their origin. 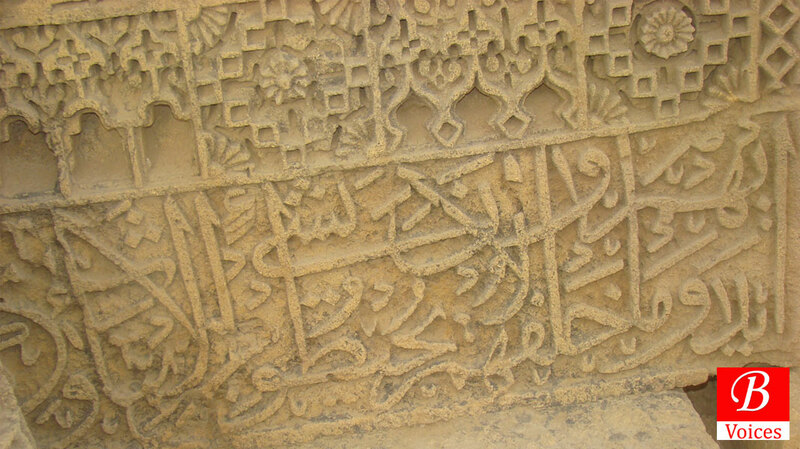 Among the generally assumed stories about the tombs are the stories of Muhammad bin Qasim and Alexander the great. “These tombs are of warriors of Muhammad bin Qasim,” explains Fazal, a shepherded, who often comes to ‘rear his cattle’ at Sarai Graveyard at Bhawani! “After defeating the other tribe, the victorious one pursued the defeated but the head (syed) of the victorious tribe prohibited his disciples to chase the ousted one. When disciples kept following, the Syed ordered them not to chase the ousted tribe beyond when they see a ‘gabi’ (a calf), but syed was defied and the victory turned into a defeat,” Dr. Hafeez Jamali shares a same legend linked to the history of tribes who are buried under these tombs. First danger that Tombs are facing is in the form of damage caused by the people who consider the tombs as holy worshiping sites. The myths have led common people to believe that “holy” warriors of Muhammad bin Qasim, are buried inside them. 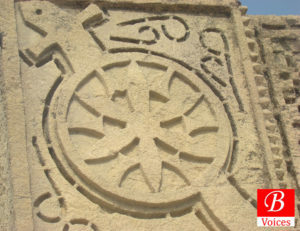 This in return, attracts disciples and pilgrims from across Sindh and Balochistan endangering the tombs further. “These buzargs (saints) listen to everyone’s appeal,” says Ayub, a pilgrim, at Hinidan Graveyard, “I often come here to pray to them in order to get my wishes fulfilled,” he told this scribe. “I had three wishes to be fulfilled,” shares Ayub, “and two of them have been gotten fulfilled by the saints,” he wonders. 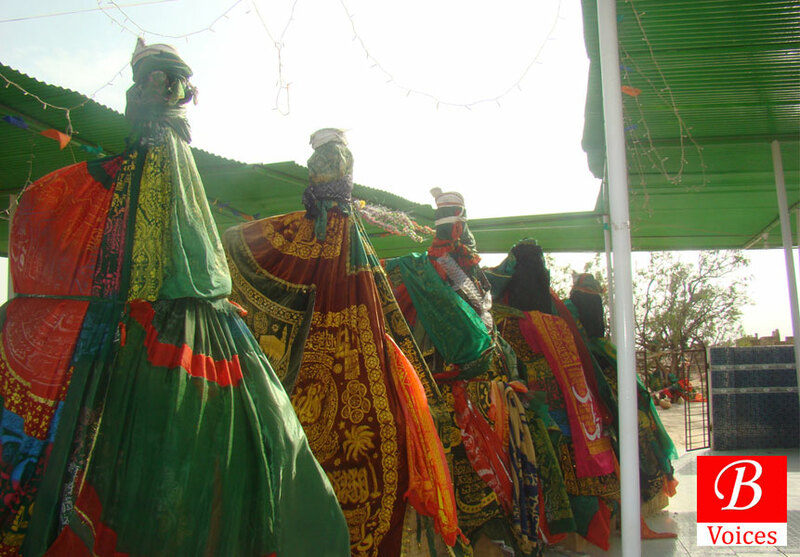 Ayub was sitting near five Chaukhandi Tombs fenced and wrapped in green and red crocheted pieces of clothes embroidered with some Quranic Verses. 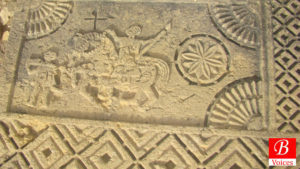 The disciples have made these additions to the graves in religious devotion but what they don’t know is that this act is destroying the graves. Furthermore, second danger faced by the tombs is that these are left unattended. The weather of the area is harsh and dust storms are a normal routine, which damage the tombs. The annual heavy rainfalls also affect the tombs and cause them to crumble. During a visit to Chaukhandi tombs, this scribe discovered cracks in tombs which can totally be destroyed in next few years due to harsh weather. Archaeological sites are considered as delicate structures and laws are put in place to protect and preserve them. 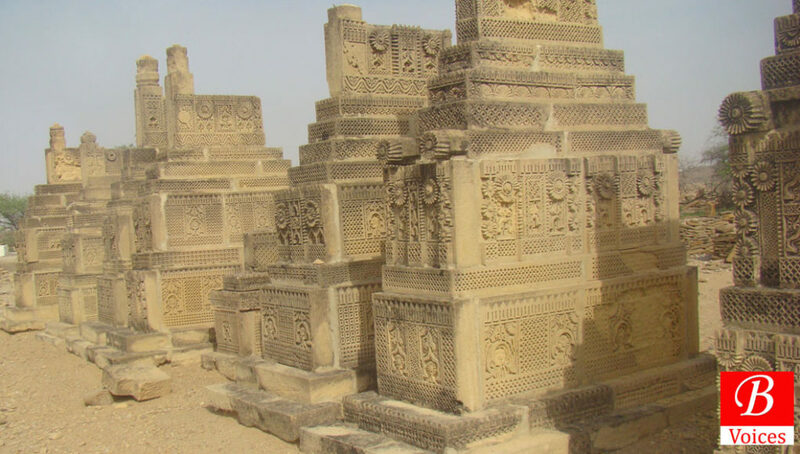 After inception, Pakistan inherited Antiquity Monuments Preservation Act 1904. Subsequently it was replaced with Antiquities Act 1968. Under this law, any building prior to 1857 was considered ancient. This also made federal government guardian of any monument or antiquity which was deemed unpreserved and considered endangered to vanish. Similarly, the law also differentiated between a monument and antiquity where monument referred to ancient buildings and antiquity to moveable cultural objects. However, the Antiquity Act was further replaced with a new law adopted in 1975 (amended in 1990). This defined the government authority on ancient monuments and antiquities as now it could take any monument or antiquity of national significance to preserve and protect. The law also prohibited initiating any construction work within the 200 feet from protected sites or antiquities. In year 2010, 18th amendment was passed which devolved the subject of archaeology and heritage. Initially the archaeological sites were handed over to provincial governments but later the federal government changed its mind. In 2015, federal government notified that Heritage sites belong to federal and not provincial governments. This reversal in policy has created a sense of confusion on the question of jurisdiction and which entity will protect the heritage and archaeological sites. After devolution Balochistan also made its own laws to protect heritage and archaeology. In 2010, Balochistan Cultural heritage preservation Act was adopted and in 2014 The Balochistan Antiquities Act was enforced. These laws empower Department of Archaeology and Heritage to take steps to preserve the archaeological sites. However, the visit of Chaukhandi Site by this scribe proves that these departments are not doing their job. 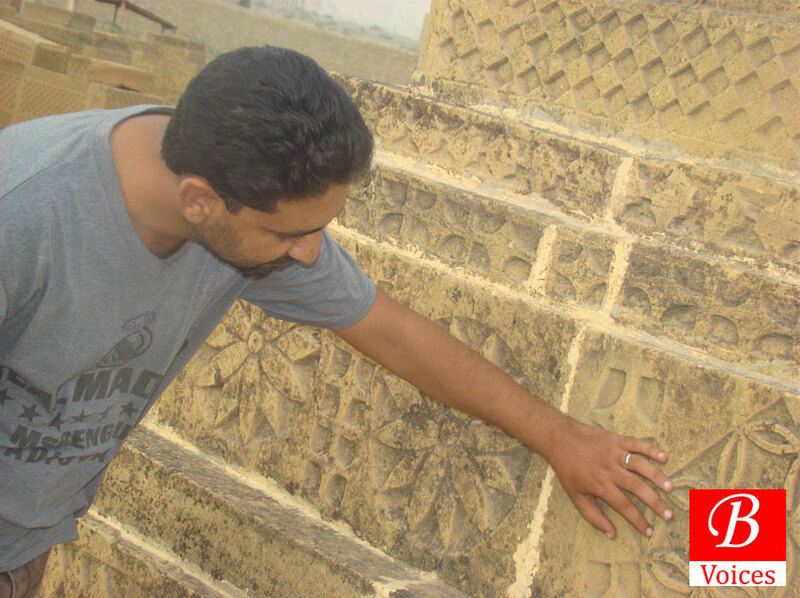 Mr. Shabbir Khan works as Administrative Officer at Archaeology department. He admitted that his department is not preserving the sites. “Main problem faced by the Directorate of Archaeology of Balochistan is the lack of budget which hampers the process of preserving archaeological sites,” He told Balochistan Voices. Defending the Archaeology department, He added that when due to resource shortage department finds it hard to fund administrative expenses then the preservation of archaeological sites naturally become the last priority. Archaeological sites of Chaukhandi Tombs are remnants of past but they provide a link to certain social values, beliefs, religions and customs. These enrich the present culture of today and therefore need to be preserved for future as well. Have something to add, write it down in comments section! Next articleHanna Lake Dried Up: Natural Cause or Government Negligence?